This is a continuation from my post StarCraft II Beta Overview. In the last post, I mentioned among other things the apparent lack of improvement for the Terran and Zerg in comparison to the Protoss. Improvement, that is, in capability from the original StarCraft to StarCraft II. Now I am going to change my opinion on that. After extensive play, I found Terran to feel just as innovative as the Protoss. Perhaps it was because I was trying only old units at first: Marines, Siege Tanks, Battlecruisers. These units are pretty much the same. On the other hand, old Protoss units like the Zealot and Dragoon, which is now the Stalker and Immortal, gained new abilities. Perhaps this is why the Terrans felt so unimproved. But as soon as I started using new units—Reapers and Vikings especially—the Terrans seemed to be a lot stronger. The Reaper was especially impressive. In the last post I said that the Reaper’s cliff jumping did not add much power to the Terrans, but I found this statement to be totally wrong. That game, I was against Protoss. I set up a generic Marine plus Supply Depot defense, and then built 12 Reapers. I sent the Reapers on a raiding mission through a roundabout path, and the opponent’s army must have been on the offensive—it was missing from its base. I managed to destroy the Nexus just as the Zealots and a couple of Stalkers made it back to defend. At that point, the game was virtually over. Overall, the Terran units seem to fill all the needed roles, and the units work together well. The only unit I have a problem with is the Banshee. It seems completely redundant. I built a few for testing purposes, but in an actual game I have not ever felt the urge to build one. Basically, the Banshee is an air-to-ground attack unit. But Terrans already have three ground units that can hit ground-only: Marauders, Hellions, and Siege Tanks. And each of these has a special effect: slowing, line splash, and area splash. The Banshee simply doesn’t help. True, it has the special ability to cloak, rendering it invisible. But Protoss Observers, Zerg Overseers, and Terran Scanner Sweeps all cause the Banshee to be useless—the Banshee can’t attack air units, so if you happen to have a group of cloaked Banshees, and see an Overseer (or suspect that there’s an Observer and use Scanner Sweep to reveal one), you can’t do anything about it. Then why not include air-to-air units like Vikings with the group? Well, then it would somewhat ruin the point of an invisible air force. Other than the Banshee, however, the new Terran units seem amazing. The Reaper I have already mentioned. My next favorite is the Viking, an air-to-air flyer that can transform to a mechanized ground unit that can attack ground targets. That said, my main use of the Viking is for anti-air (as Terrans, without the Goliath, don’t really have any other good way to counter air). It is very effective against capital ships, or any large air unit. A few Vikings can punch serious damage into a small Carrier fleet. Vikings are fast, cheap, strong, and efficient. The ground form is pretty useful—it’s especially good for raiding. Regarding other units, in gameplay I feel the Siege Tank is much stronger than it was in StarCraft. In the original, it dealt 70 damage per hit in Siege mode, but had a 50% damage reduction (down to 35) against small units like Marines and Zealots. Now it deals 60 damage, but with no damage reduction—a damage bonus of over 70% against small units. It also has slightly more range, 13 instead of 12. The Marauder is a very interesting unit: it comes really early in the game, and is much tougher than a Marine, with 125 hitpoints and 1 armor as compared to 45 hitpoints and 0 armor. Plus, it does as much damage as a Dragoon did in the original StarCraft: 20 to armored (large), 10 otherwise, and has an additional slowing effect per hit. Marauders are also classified as Biological (as well as Armored), allowing Medivacs, which come later in the game, to heal them. I would still say that the Hellion and Thor are not as amazing as the other new units, but are strong nonetheless. Ghosts and Ravens are the Terran spellcasters, and are both pretty powerful. The Raven’s Auto Turrets are especially good. And meanwhile, the Ghost has access to nuclear launches much, much earlier in the game. With that, I’d say the Terrans and Protoss (see last post) are both well made. But the Zerg still seem to offer the player fewer options. Roaches are extremely powerful, but are somewhat boring to use. They have Burrow, but how boring is that compared to Charge, or Blink, or cliff-jumping?! 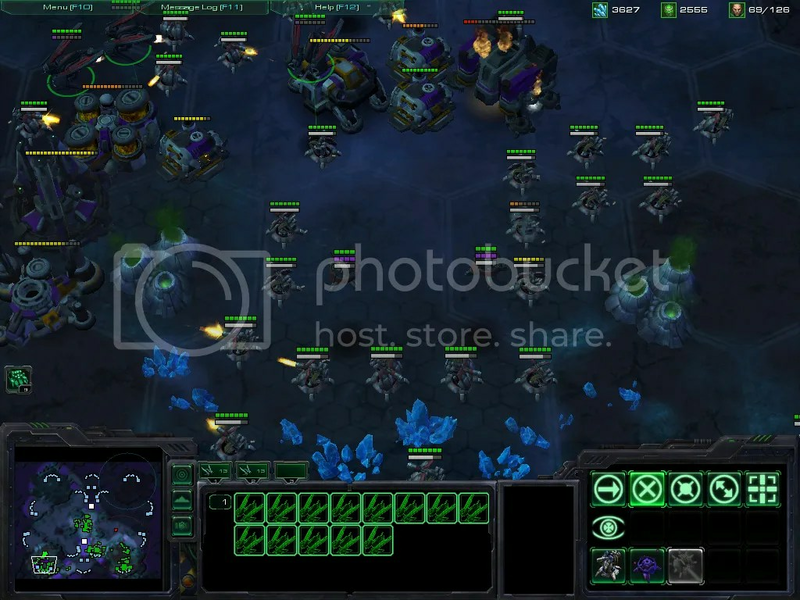 The Protoss, with Warp Gates, Warp Prisms, Charge, and Blink, became more mobile than before. Terrans, with Thors, Vikings, Reapers, gained raw power and mobility (though it’s also easier to turtle with upgradeable 6-slot Bunkers as compared to 4). Zerg seems to have gained little. True, my opinion on them might change the next few days, as it did for Terran the past few. Maybe I haven’t adapted to the feel of the new Zerg yet. Whatever the case, I can still say StarCraft II is looking incredible so far.